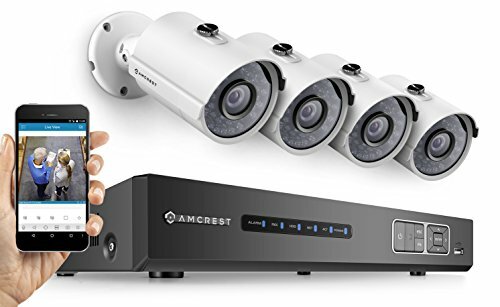 4-Channel 720p Tribrid DVR with Pre-Installed 1 TB HDD / 4 x 720p (1.0MP) Cameras / Easy Smartphone & Web-browser Access (MAC & PC) / VGA & HDMI Output / Backup to External Storage via USB This system utilizes HDCVI's closed-circuit design with analog cameras while also connecting with your IP cameras (up to two). Watch things happen as they happen: receive real-time, highly reliable HD video without loss or delay, transmitted at ultra-long wireless range. HDCVI provides a highly secure closed network as well as a painless and non-complex plug-and-play setup process. 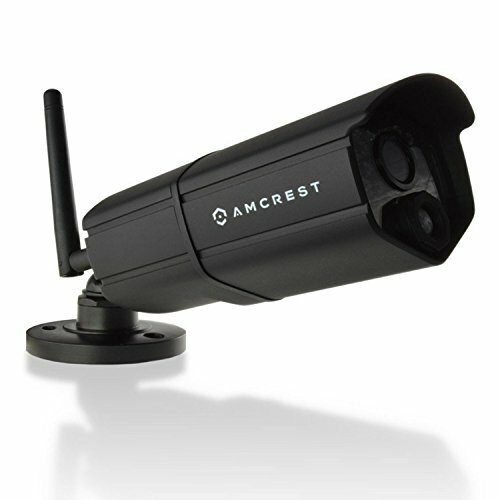 A new cornerstone in the consumer market for private security technologies and an unsurpassed value with Amcrest's 1 Year US Warranty, each system is further enhanced by DIY installation and the plethora of features outlined below. A monitor or television is recommended for the initial setup. 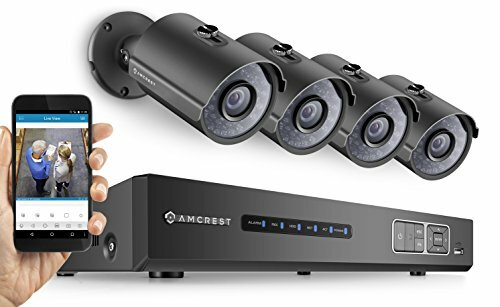 4-Channel 1080p Tribrid DVR with Pre-Installed 2 TB HDD / 4 x 1080p (2.1MP) Cameras / Easy Smartphone & Web-browser Access (MAC & PC) / VGA & HDMI Output / Backup to External Storage via USB This system utilizes HDCVI's closed-circuit design with analog cameras while also connecting with your IP cameras (up to two). Watch things happen as they happen: receive real-time, highly reliable HD video without loss or delay, transmitted at ultra-long wireless range. HDCVI provides a highly secure closed network as well as a painless and non-complex plug-and-play setup process. 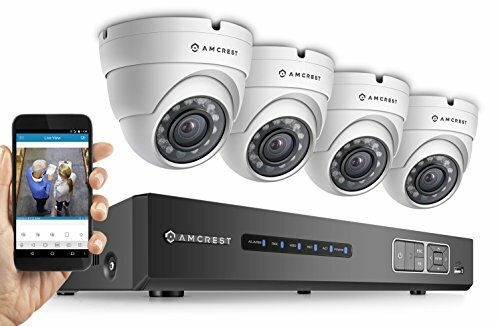 A new cornerstone in the consumer market for private security technologies and an unsurpassed value with Amcrest's 1 Year US Warranty, each system is further enhanced by DIY installation and the plethora of features outlined below. A monitor or television is recommended for the initial setup. 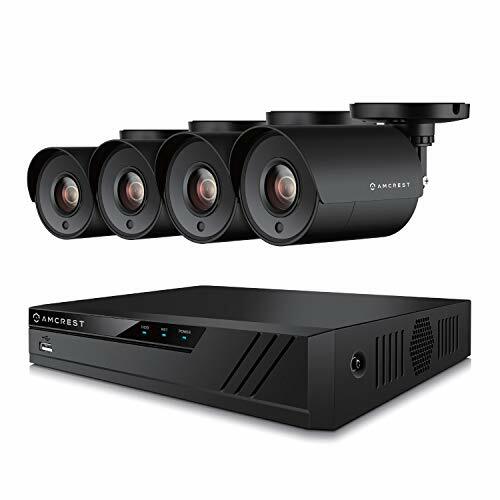 8-Channel 720p Tribrid DVR with Pre-Installed 2 TB HDD / 8 x 720p (1.0MP) Cameras / Easy Smartphone & Web-browser Access (MAC & PC) / VGA & HDMI Output / Backup to External Storage via USB This system utilizes HDCVI's closed-circuit design with analog cameras while also connecting with your IP cameras (up to two). Watch things happen as they happen: receive real-time, highly reliable HD video without loss or delay, transmitted at ultra-long wireless range. HDCVI provides a highly secure closed network as well as a painless and non-complex plug-and-play setup process. 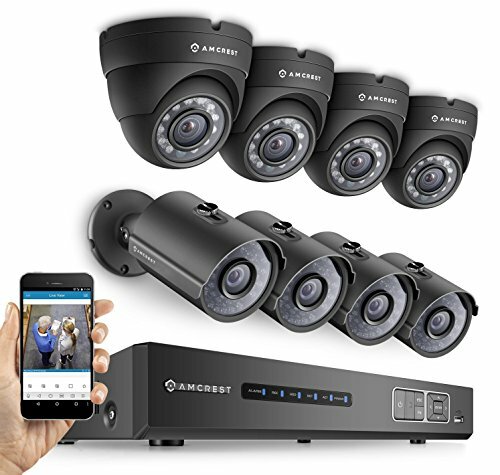 A new cornerstone in the consumer market for private security technologies and an unsurpassed value with Amcrest's 1 Year US Warranty, each system is further enhanced by DIY installation and the plethora of features outlined below. A monitor or television is recommended for the initial setup. 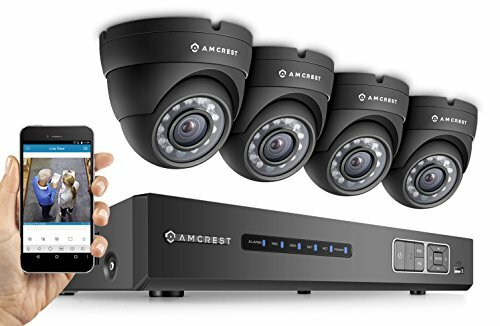 8-Channel 1080p Tribrid DVR with Pre-Installed 3 TB HDD / 8 x 1080p (2.1MP) Cameras / Easy Smartphone & Web-browser Access (MAC & PC) / VGA & HDMI Output / Backup to External Storage via USB This system utilizes HDCVI's closed-circuit design with analog cameras while also connecting with your IP cameras (up to two). Watch things happen as they happen: receive real-time, highly reliable HD video without loss or delay, transmitted at ultra-long wireless range. HDCVI provides a highly secure closed network as well as a painless and non-complex plug-and-play setup process. 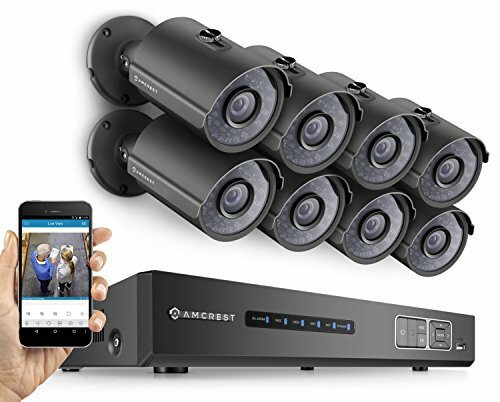 A new cornerstone in the consumer market for private security technologies and an unsurpassed value with Amcrest's 1 Year Warranty, each system is further enhanced by DIY installation and the plethora of features outlined below. A monitor or television is recommended for the initial setup. 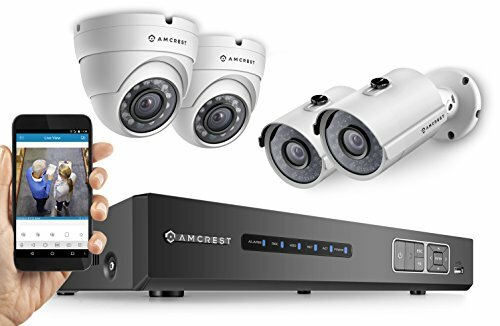 4-Channel 720p DVR with Pre-Installed 1 TB HDD / 4 x 720p (1.0MP) Cameras / Easy Smartphone & Web-browser Access (MAC & PC) / VGA & HDMI Output / Backup to External Storage via USB This system utilizes HDCVI's closed-circuit design with analog cameras while also connecting with your IP cameras (up to two). Watch things happen as they happen: receive real-time, highly reliable HD video without loss or delay, transmitted at ultra-long wireless range. HDCVI provides a highly secure closed network as well as a painless and non-complex plug-and-play setup process. 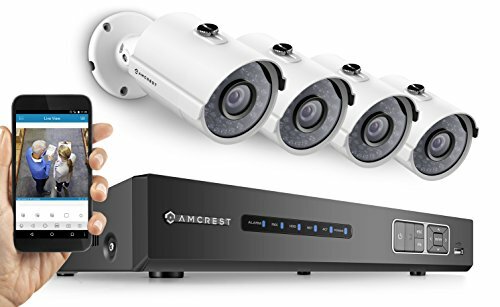 A new cornerstone in the consumer market for private security technologies and an unsurpassed value with Amcrest's 1 Year US Warranty, each system is further enhanced by DIY installation and the plethora of features outlined below. A monitor or television is recommended for the initial setup. 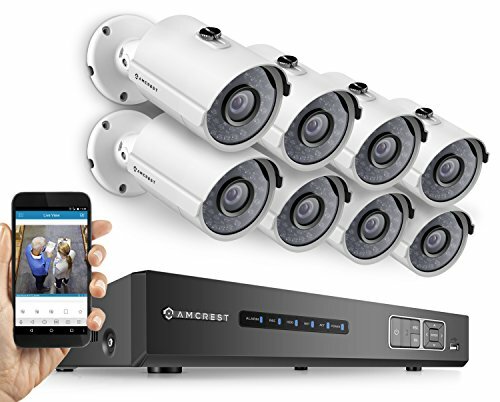 8-Channel 720p DVR with Pre-Installed 2 TB HDD / 8 x 720p (1.0MP) Cameras / Easy Smartphone & Web-browser Access (MAC & PC) / VGA & HDMI Output / Backup to External Storage via USB This system utilizes HDCVI's closed-circuit design with analog cameras while also connecting with your IP cameras (up to two). Watch things happen as they happen: receive real-time, highly reliable HD video without loss or delay, transmitted at ultra-long wireless range. HDCVI provides a highly secure closed network as well as a painless and non-complex plug-and-play setup process. 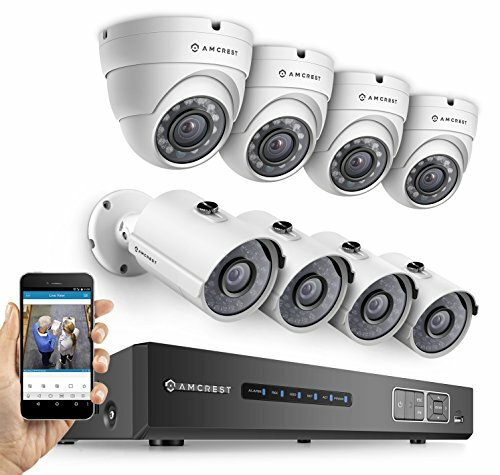 A new cornerstone in the consumer market for private security technologies and an unsurpassed value with Amcrest's 1 Year US Warranty, each system is further enhanced by DIY installation and the plethora of features outlined below. A monitor or television is recommended for the initial setup.